Successfully climbed the pipe hill today. Today's ride was so much fun. 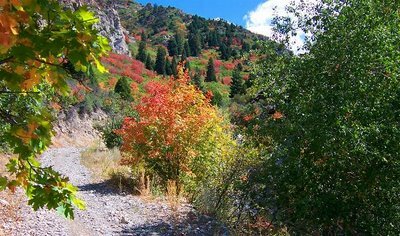 The fall colors are making Slate Canyon more beautiful than usual. Today's picture is of the hill we call Slate Hill. We spent some time today clearing a path through the rocks, and taking pictures. Also on the way up the trail I ran over a nice large tarantula. I tried to miss it but ran over it anyway. Somehow though it didn't seem to have killed it because it crawled off the trail.